Visit your ward office soon after the baby is born. Have Ⅰ―1 to Ⅰ―6 processes done there. For Ⅰ―7 you don’t need to do anything at the ward office. Just wait until a postcard is sent to you. Next visit the regional immigration office for Process Ⅱ within 30 days. While you are still in the hospital you will receive a document called the “shussei shoumei sho 出生証明書”(Proof of Birth) in Japanese from your hospital. Bring this document and your ”Boshi-techo” 母子手帳(Maternal and Child Health Handbook) to your ward office. In this document, the certificate proving birth is on the right hand side and the birth notification (“shussei todoke” 出生届)is on the left hand side. You have to fill in the blanks on the birth notification on the left hand side. The names of the baby and his/her parents should be written in both English and Japanese Katakana in the same order that you’ll register them in your country. The method for notifying your country of the birth of a baby varies from country to country. Please contact your embassy for details. For example, you may need the document “Proof of Birth” in Japanese issued by your hospital. Or you may need to have an English birth certificate written by your obstetrician. Sometimes you may be required to submit a translation of birth certificates (from Japanese to your mother language) with /without a notary certificate. Often a few photocopies of the document “Proof of Birth” are needed, so we suggest that you do, and keep on hand, some photocopies in case you need them to register the birth with your country, etc. The original document “Proof of Birth” will not be returned after you submit it to your ward office. You can obtain copies of the“Certificate of Acceptance of Birth Notification (shussei todoke jyuri syoumei sho 出生届受理証明書）” or “Certificate of Entry in the Resident Card” (kisaijikou syoumeisyo 記載事項証明書) for 350yen each after registering your baby. Refer to EMPLOYEES’ HEALTH INSURANCE (EHI) written by AMDA. You will be able to claim a refund of the balance at your ward office, if your actual delivery expense was less than the lump-sum allowance and you are a national health insurance member. Bring your bank account information. If you are not a national health insurance member, ask your employer or insurance provider. Child allowances are offered to those raising children, up until the first March 31 after the child’s 15th birthday. The allowance will be issued the month following the completion of application procedures (there are income-based limitations). Visit the ward office where you live for details. Note: Bring your health insurance card and bank book. Every year you have to send a confirmation of household status and income to continue to receive this allowance. 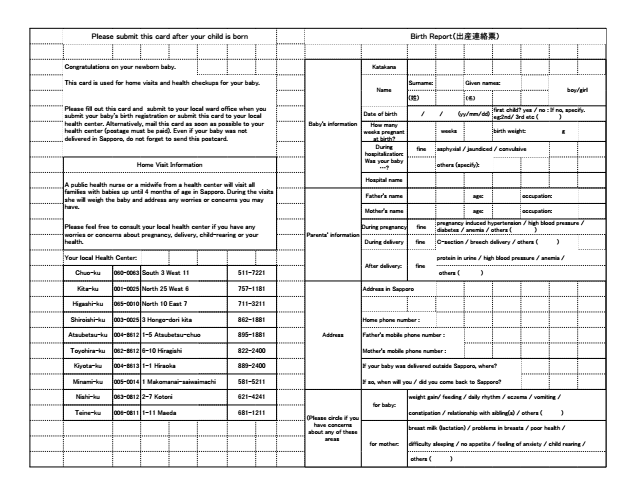 A birth report card (shussan renraku hyo出産連絡票) in English is contained in the Maternal and Child Health Handbook. Inform your local health center by putting the card in a post box placed inside your ward office. A maternity nurse from the health center visits homes to offer consultation on　newborn infant care. 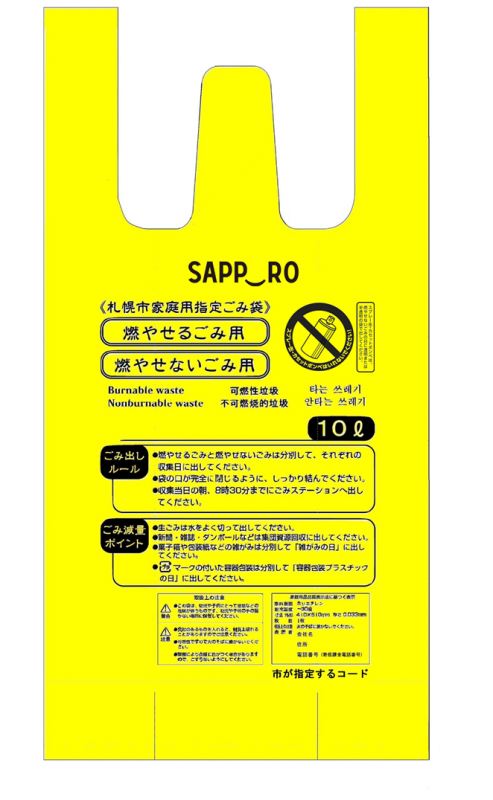 Our city will give you disposable bags in bulk for the use of babies’ waste. The amount can be enough for your baby up until he/she becomes 2 years old. By the beginning of the third month from birth registration, an exchange ticket (a post card) for designated disposal bags will be sent to you. You can receive them by submitting this ticket at the designated place written on it. You can choose either 10 liter bags or 20 liter bags. If one of the parents is a student, a certificate of enrollment, certificate of scholarship, withholding slip (a certificate of tax deducted at the source) and the bank book which shows your living expenses are necessary.